This post will discuss how to structure your Hiera Data, so that your profiles will automatically inject the parameters. Why? So we can keep our profile classes and other classes super clean and succinct. If you have If else statements in your classed depending on what environment or node the code is running on, you might have a code structure smell. Lets dig in. 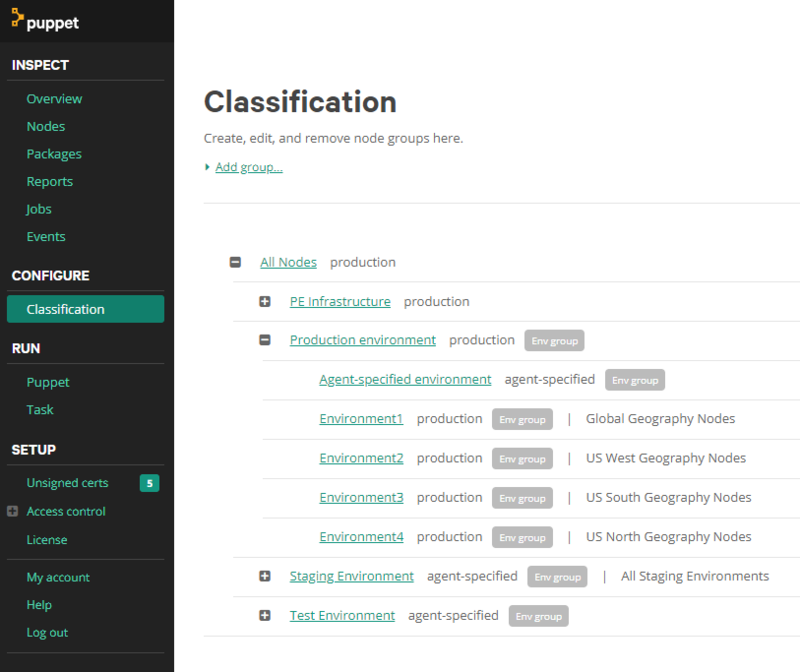 Secondly you are using Profiles and Roles pattern to structure your classes. I highly recommend you download the Puppet Control Repository template here. The most important aspect to consider is structuring your Profiles and Roles to accept parameters that can be resolved and matched to Hiera Data. Here we have a role for all our Jumpboxes that we can use to remote into. Lets pick one of these profiles that require data from Hiera. The above profile ensures that the /etc/hosts file has some entries in it. Similar to Java or C# we can use a sort of dependency injection technique, where puppet will automatically look for this parameter in Hiera; a key/value store. The trick is to structure your Hiera Data and use the same Fully Qualified Names in the keys. Each environment needs a different set of host names. The second important convention is we use a geography variable in each Environment to resolve Hiera Data automatically. Go to your Puppet Master Enterprise Web Console and manage the Classifications. What you are doing is creating a variable that can be used by the hiera.yaml file to dynamically load data for the correct environment when the agent runs. 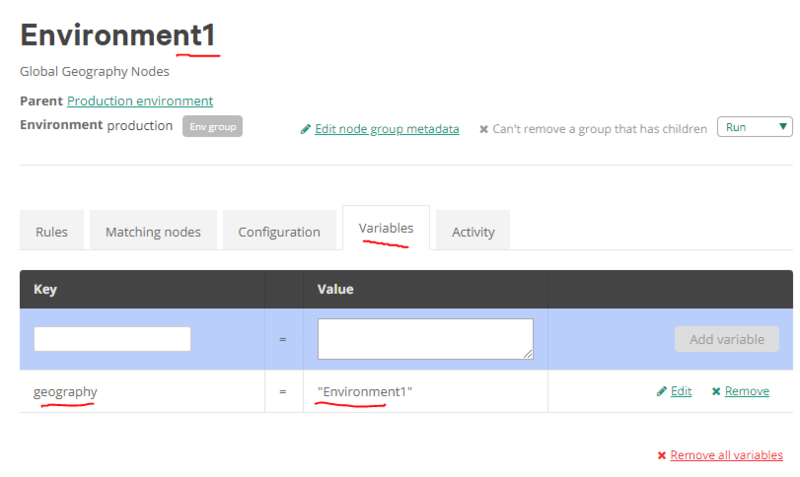 On the Puppet Master we need to setup our environments to match the Control Repository and add the magic variable. Any Node that runs the puppet agent will then have this variable set. This can then be used to load the corresponding Hiera config file. This is all done automatically for you. Let us dig a little deeper and see how this structure is configured. This file now contains the instructions to tell Hiera how to load our data. the .yaml files will contain the same variable names (fully qualified) that match the PROFILE files e.g. As you can see above. As long as your profiles and parameters match, Hiera will automatically inject the correct parameter for each environment. Encrypted data is just as easy to store. * Generate the encrypted data. * Store the data in an eyaml file in the same folder as the yaml data. * Add a path to the data in the hiera.yaml file. We use the Puppet Master private key to generate the encrypted data, see the end of this blog on how to create encrypted data. We use Azure Active Directory Domain Services and wanted a single sign on solution for Windows and Linux. The decision was made to join all servers to the Windows Domain in addition to having SSH Key auth. I assume you know how to use Puppet Code Manager and have a Puppet Control Repository to manage Roles and Profiles. Ensure you have a Active Directory Service Account that has permissions to join a computer to a domain. You can store this user in Hiera. The module we need is called Realmd, however the current version (Version 2.3.0 released Sep 3rd 2018) does not support Ubuntu 16.04. So I have a forked repro here that you can use. Its fqdn is in the /etc/hosts file so it can resolve to itself. With the above running on your Linux agent, you will have Linux machines using the domain and can leverage single sign on. CASE SENSITIVE – Ensure you use Upper Case for $domain. However, here is a Hiera config file to get you going for this class if you like using a key value data source. In my next article, I will write about setting up a flexible Puppet Control Repository and leveraging Hiera. Now I can login to the server using my Azure Active Directory credentials that I even use for Outlook, Skype and other Microsoft Products.